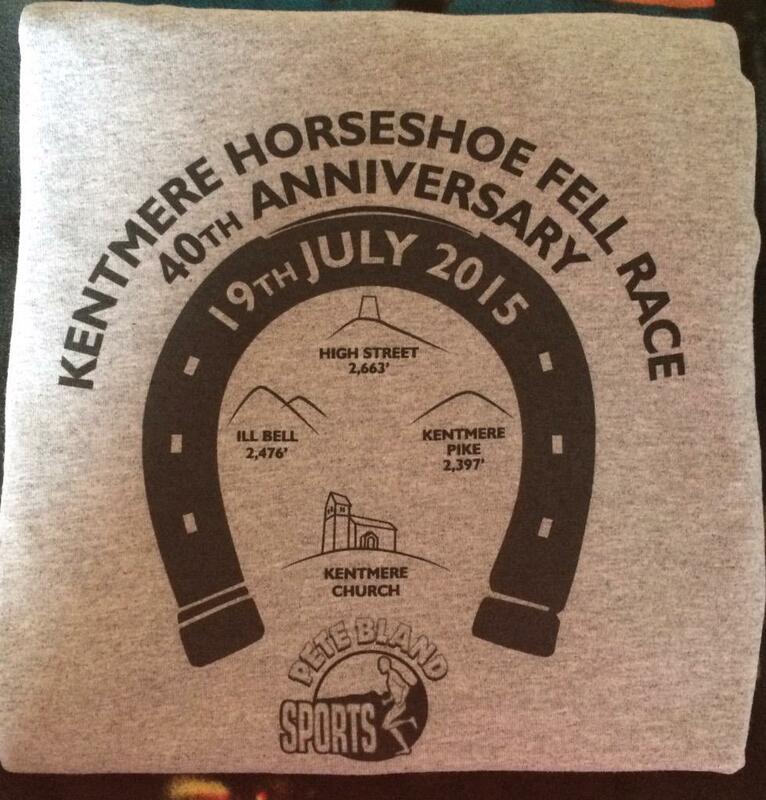 The time had come, it was the day of my first Lakeland fell race & I'd decided on racing the Kentmere Horseshoe. I'd had my eye on it all season, as it was on our club fell championship fixture list, but, at the beginning of the year I didn't really anticipate that my fitness, strength and speed would improve so much that I would feel ready and would be happy to attempt to race it, after all, the Lake District is where the big boys - both mountains and runners, come out to play!!! 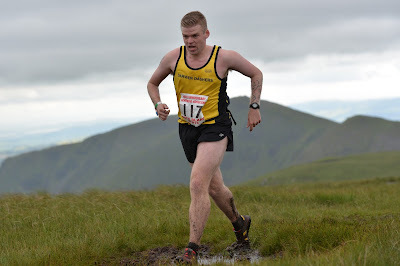 I was up to 46 races for this season before Sunday, so I was easily race fit, but this was to be my longest fell race and also included an amount of ascending that I hadn't experienced before. I have recently (about 6-8 weeks ago) started to hit a minimum of 5,000 feet per week for my ascending, which seemed a decent amount without putting my legs out of action on a daily basis, but, saying that, Kentmere is around 3,300 feet on it's own so it was always going to be testing. 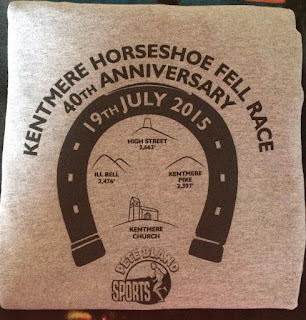 We arrived with plenty of time before the start of the race (1pm start) and collected our numbers, 40th anniversary t-shirt (the first thing I've ever got from a fell race so far!!) and made sure we had our dibbers attached as it was needed for the 3 checkpoints and the finish line - something I'd not used before but it seemed easy enough. The warm up was a lot shorter than my usual, as I wanted to keep as much in my legs as possible for the race, so a couple of hill reps in the field/on the day car park, were enough for me as I was buzzing so much from the pre-race adrenaline I probably could've ran all day!! In my head this race was a huge milestone for me personally, to most of the field it was just another fell race to get round, I imagine. The weather was near enough perfect for running, no rain but no blistering sun either. Pete Bland gathered us on the start line at the bridge and after the short briefing off we went. 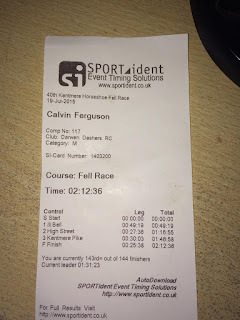 I'd picked up some tips pre-race, via text, about the route from Ben Mounsey, so I was aware that the start wasn't to be attacked at full pelt, with a risk of burnout so I took it steady(ish). I felt reasonably strong, as I should less than 1.5 miles in to a 11.5 mile race and once we'd climbed up through the ferns through Garburn Pass, it was time to get a bit of running done! As we climbed towards CP1, Ill Bell, I was more than happy to keep a decent running speed going but people around me were taking on gels and nutrition already, rather puzzling about 2 miles in to a race? Anyway, it didn't put me off, it just made me feel better about myself as I ran past these people who seemed to be already struggling. From Ill Bell, there was a decent bit of running up towards High Street - very boggy in between these points on the day but still runnable for me. There were points again when I thought "am I going out too hard, too early here?" as I was passing a lot of people just by fell walking on certain parts. I didn't let it distract me and continued as I felt strong enough to be able to keep going at that pace. As I've mentioned on Twitter/Facebook since, my genuine pre-race expectations were that I'd finish around 70%-80% back in the field, behind the winner. As I dibbed in at High Street, the marshal shouted out "151! "...it was like a light bulb moment - I thought, hang on? I know there were over 450 pre-entered and I'd heard around 20% don't turn up when on-line entry is involved but that still makes around 350 runners, meaning I'm well in the top half? This was a massive boost at the half way point and made me focus that little bit more as I was half way to achieving a finishing position that I didn't dare imagine before I started that afternoon! Also, this coupled with my slightly better than average descending skills (I only base that purely on the number of people I seem to overtake from the race high point to the finish in previous races), meant that I could surely gain some more places before hitting the flat on the lanes back in to Kentmere village. I continued up and down the peaks and troughs between High Street & Kentmere Pike, before reaching the pike and CP3. The infamous Shipman Knotts was up next though and if I was going fall anywhere, it was probably going to be here. My footwork though isn't too bad, which probably has something to do with playing football for so many years and I narrowly avoided losing teeth/my nose at one point though. I tried skipping over what I thought was a lump of grass while overtaking, only to find my studs catch the top of a sharp rock, so for the next 15-20 metres I was scrambling to keep my balance with my face only about 2 feet from the floor - an amusing sight to the bloke running alongside me. It was then time for the descent. I'd heard a lot about it pre-race and to be honest I'd totally forgot while running the race. Looking back at it now, it was by far the most technical and difficult descent I have done so far. I basically had a choice of running down through the stream (it was a lot more difficult than it sounds!) or running through the bog and long grass to the right of it. I kind of dabbled in and out of both parts to be honest, using that split second thinking to judge where and when I should be stepping aside - I felt a bit like Bruce Grobbelaar with his spaghetti legs against Roma in '84 and people around me found themselves falling and slipping but yet again I managed to keep myself upright and after a good mile or two negotiating it, I found myself on the lane back towards the village. I very nearly missed the right turn through the wall as the runner close in front of me was blocking any decent range of vision for me, but luckily he saw the sign and we hopped through the gap in the wall to follow the tape through the fields. I passed another few runners who had pulled up with cramp, I asked them if it was anything serious but they all just unhappily responded with "no, just cramp, mate". There was about 1/2 a mile to go and I was in a small group with another 2 runners, one in front of me and one behind and I still felt strong chasing down the road just before the turning at St Cuthberts church, which is about 100 metres from the finish. As the runner in front was enjoying himself I thought I'd sneak in with a late sprint as we got to the field and we had a good little 20 metre race to finish the day in great spirits. Overall, a fantastic experience for me and a superb race route. I performed a lot, lot better than I expected, finishing in 143rd place (out of 342 runners who finished the race), in a time of 2 hours 12 minutes. I felt strong the whole way around which was even more of a bonus and it felt like all my training had paid off, especially the increased climbing I had been putting in, after all, I was still passing runners with my fell walking as we were heading for Kentmere Pike, yet again, something I didn't anticipate...Also, when I compared my splits with some other runners times on the final results, I'd gone down from Kentmere Pike to the finish quicker than some runners who were 40 to 50 places above me overall, another thing I surprised myself with. 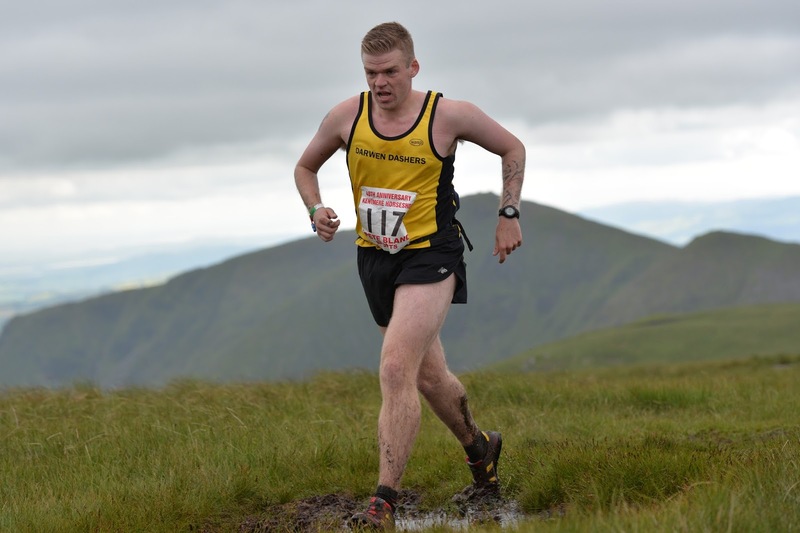 In conclusion, after a bit of post race thinking, I know I will be back in the Lakes for more races, I just felt at home there and after exceeding my expectations by so much, I feel like I can further improve my running by obviously using more of the Lakeland terrain to bump up my experience. 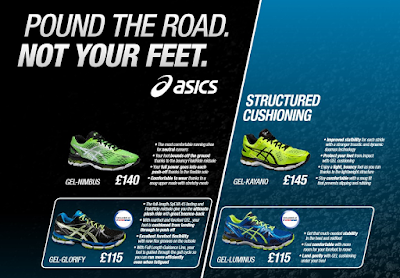 There are other shoes below the Luminus too but if you are looking for a top quality shoe for long distance running, the Luminus is definitely up there and as with competition in a race, you'd settle for a place in the top 2, wouldn't you?! Above are my 3 runs that I have ran so far in the Gel-Glorify shoes (Top to bottom; Tuesday, Wednesday & Thursday). Most of this won't really mean anything to anybody else apart from myself but to feel comfortable running those distances in brand new shoes is a great feature and Asics should be applauded for that! As soon as I put them on, they just felt like I had worn them in for a few weeks, that's how comfortable they are! 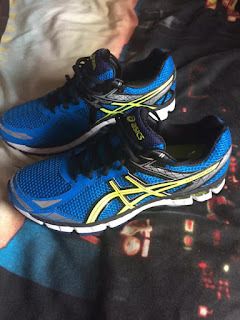 After doing some previous product reviews in the past for The Running Bug, Asics and Intersport UK, they very kindly asked me to test out some more kit, starting with the new Gel Indicate shoes. As most of you runners will agree, you can't beat a fresh pair of running shoes so I was excited to receive the email regarding the new kit. My road miles have been pretty minimal over the past few months as the fell season hits it's boom over the summer with more races than even I can manage to keep up with, and I'm up to 50 for the season at the minute after running at Whittle Pike on Wednesday night. But, saying that, what better reason to get myself on the road more than new shoes?! I don't think there is a better reason! Anyhow, I received my Gel Indicate's in the post a couple of weeks ago and I have got myself used to them now, doing a decent amount of miles, although not as many as I'd have liked due to a hamstring twinge I had over the past 5 or 6 days.